Corrective and preventive action is useful to eliminate the problem occurred during the manufacturing process. This helps the system to prevent the re-occurrence of the problem during manufacturing and analysis. Corrective and Preventive Action (CAPA) or what can be termed as corrective action are improvements imposed on an organizational process to eliminate undesirable situations and non-conformity. CAPA is characterized by a set of actions that regulations or laws require an organization to adhere to in procedures, documentation and manufacturing activities. It also includes systems that are developed to eliminate or rectify recurring non-performance. People may have varied perception regarding CAPA, but one thing that remains undisputed; the vitality of CAPA in different fields including the health sector. In certain industries and markets such as pharmaceutical and medical device industries within the United States, CAPA may be required as part of the quality management system. In such an instance, failure to adhere to the regulations under CAPA handling may be considered a violation of the federal regulations on acceptable manufacturing practices. As a result, a medical device or a medicine can be termed as substandard or adulterated in the event a company has failed to analyze, record and investigate the root-cause of non-conformance and failed to implement and design an effective CAPA. CAPA is an essential tool in improving an organizations' processes. It is always taken to eliminate undesirable situations and non-conformity. It is a concept within numerous ISO business standard, hazard analysis and Risk-based Preventive Controls, and good manufacturing practices. CAPA focuses on the systemic investigation of the key reason behind an identified risk or problem in an attempt to prevent occurrence under the preventive actions or prevent recurrence under the corrective actions. CAPA, under the corrective actions, facilitates the implementation of actions that address issues identified during an internal audit, unacceptable level of product non-conformance, customer complaints, as well as unstable or adverse trends in process and product monitoring such as those identified by statistics control process. Preventive actions, on the other hand, are implemented in response to an identified potential source of non-conformity. The other importance of CAPA is the determination of the effectiveness of a given action plan. CAPA identifies if the actions required to correct or prevent the recurrence of a given event is effective and has zero impact on the other operations. The effectiveness can best be identified through confirmation to an already set action plan. The CAPA also ensures that information relating to nonconforming products and quality problems emanate from those responsible for the prevention of such problems or assuring the quality of such products. 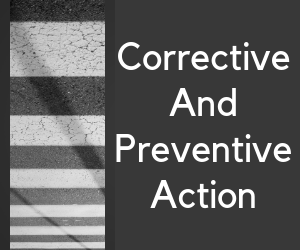 Generally, the corrective and preventive action is responsible for information collection, analysis, identification and investigation of quality and product problems and taking effective and appropriate preventive and/or corrective actions in an attempt to prevent their occurrence or re-occurrence. CAPA is responsible for validating and verifying preventive and corrective actions, communicating preventive and corrective action activities to responsible people, providing necessary information for management review, and documenting the activities that are vital in dealing with quality and product problems, preventing problem re-occurrence and minimizing or preventing device failure. To ensure that the preventive and corrective actions are effective, the systemic investigation of the primary cause of a problem is essential. CAPA is included in the overall quality management system.